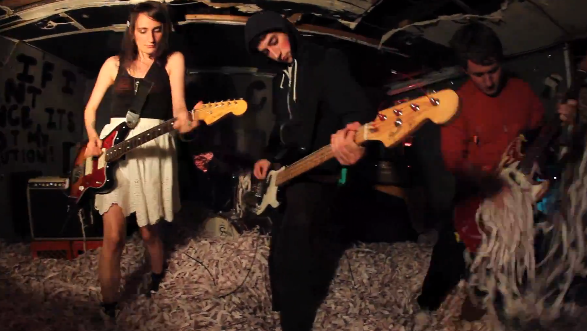 Judging from their debut album, Major Arcana, Massachusetts indie rockers Speedy Ortiz have their blend of ’90s-inspired alt-rock down pat. But as they prove with the video for lead single “Tiger Tank”, the foursome also have a keen grasp on their beloved era’s aesthetic/visual sensibilities. While they jam out in a grimy basement filled with shredded paper, complete with fish-eye lens and prerequisite effects, a couple of girls in lucha masks throw down for some good, not-so-clean amateur wrestling fun. In ’90s terms, this party is so kickin’, it makes House Party look like House Party 2. Grab a drink and join the festivities below. Major Arcana is out now via Carpark Records.